Bill Dewey is a native of San Diego County and attended Brooks Institute of Photography, the University of California at Davis and Rochester Institute of Technology. 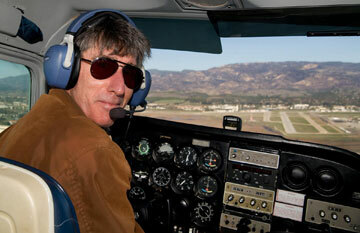 He has had his private pilot's license since 1981 and bases his aerial photography out of Santa Barbara airport. Bill has been photographing the California landscape since taking up the camera in the early 1970's and has had a photography studio/business in Santa Barbara for 30 years. Some of his favorite subjects include the California Channel Islands, the Carrizo Plain, Baja California, and the rural California landscape. A member of the Santa Barbara OAK Group, he has been distinctly influenced by the art and character of the noted California painter Ray Strong. As an architectural photographer, Bill has specialized in large format documentation for the Historic American Building Survey. This program has been contributing photographs to the Library of Congress since the 1930's. Bill's work has included the 19th century pier in Huntington Beach, California, the Mare Island Naval Base in San Francisco and the massive Saturn rocket test stands used in the Apollo moon project at Edward's Air Force Base. His work can be found in the collections of Santa Barbara Museum of Art, the Museum of Ventura County, the Carnegie Museum of Oxnard, the Santa Cruz Island Foundation, the University of California at Santa Barbara, Lompoc Valley Hospital, as well as those of many private individuals. Bill has been published extensively and his work is shown at The Easton Gallery in Montecito, CA and at the Los Angeles County Museum of Art – Art Rental and Sales Gallery.